This is an Absolutely Incredible Sport! 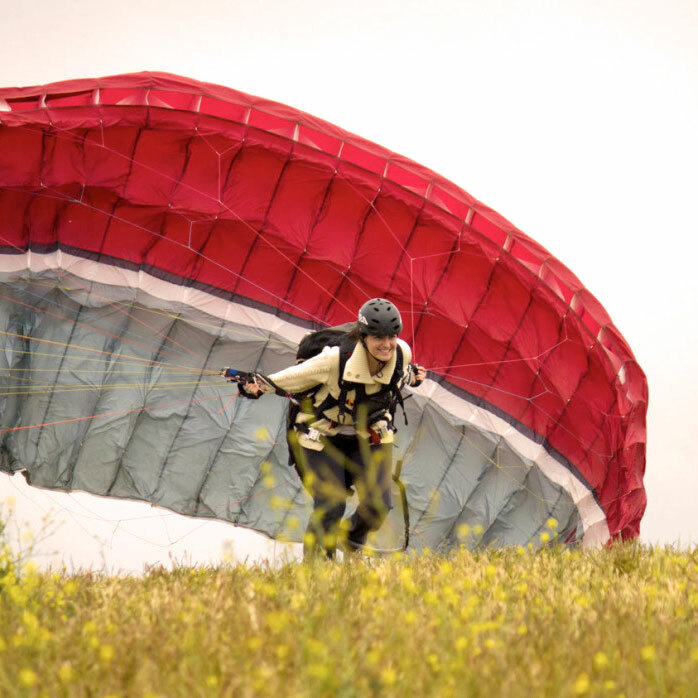 Paragliding is initially so simple that most new students fly within a couple hours of their first class. This is a sport where you get to have fun right away and then continue with a relatively quick learning curve. Within just a few days you might be soaring for hours. Your arms seem like wings as they control the paraglider above you; your flying position is as comfortable as a recliner. The thrill is unlike anything ever before experienced. For most of us the sport is the ultimate! There are many different levels paragliding can be pursued. There are those who enjoy simple top of the hill to bottom of the hill sled rides. Some enjoy soaring in smooth ridge lift. There are those who want to gain thousands of feet of altitude and fly long distances. (The current world record is 350 miles). This is a sport of progressions that can fulfill years of learning – it is truly a life long sport/ZEN. Paragliding harbors the unique quality of being all at once the most simple, yet most complicated thing you may ever experience. Regardless of each student’s goals in paragliding, Eagle Paragliding has great facilities with top-notch instructors and state-of-the-art training equipment. Our Paragliding Training Hill is perfect with gentle unobstructed slopes, and a road to the top. You will appreciate the concern for safety and the focus on developing paragliding fundamentals that will help provide you with a more secure future in the sport. We will guide you in beginning to thermal, and eventually start cross-country flying. We love to teach people flying and it shows. Not all instruction is equal. Although paragliding isn’t for everyone, it is certainly possible for almost anyone to quickly enjoy flight at our magnificent training facility. Your training will focus on developing judgment. Understanding the weather is an important tool for the avid pilot and our training helps new pilots develop fundamental skills in the interpretation of micrometeorology. We will take you through a step by step development of your ground handling skills – which is crucial to your ability to manage a paraglider with confidence. We limit the beginner class size to no more than 2 new students per instructor per day. The program will include intense ground handling, exercises in meteorology, general discussion and simulator training. 2-meter radios are used for flight training. Tandem instruction is used when necessary.